In this post you are going to learn some of the cleverest furniture makeover ideas you can use for your own benefit. This post is constantly updated for at least a month since this post publish. Bookmark this post if you want to catch new update I planned and thanks for reading this post. How to Upcycle bookshelf kitchen island (Video). How to build a reliable Upside Down Mounted Lazy Susan (Video). A Simple Dining and Desk Table makeover for your Small Living Space (Video). Most are familiar with the Murphy bed, which allows users to fold it against the wall when it is not in use. 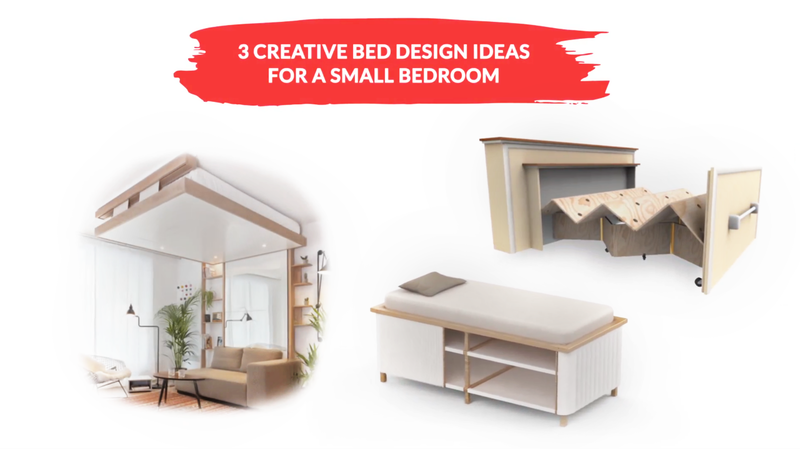 While this most definitely saves space, having your bed on the ceiling will give you the maximum amount of square footage of your room. Though its origins are from a French manufacturer, the idea in place is essentially a pulley system for the mattress and frame. Do not be intimidated by the notion, as installation isn’t nearly as complicated as it sounds, with Ikea now dipping its toes into this forum. Tip: If you decide this route is for you, use a preexisting frame by BedUp (or a similar competitor) that raises and lowers the mattress but still gives you the freedom to determine sleeping height. Graduate Yesul Jang was the original mind behind the millennial bed that is raised to waist level so items like dorm room accessories can all fit underneath, as sort of a makeshift bunk bed of practicality. Additionally, a fabric curtain can cover your belongings so that they are not in view at all times. In using such a curtain, they are cheap and quick to replace if they incur damage. Because statistically sleeping space and storage take up the most real estate in a dwelling, it is a natural blend to pair them in the same square footage. Rearranging furniture is enough to give anyone a headache, and never is this more true than shifting beds. Their cumbersome size and stature will make you tear your hair out, but fresh ideas have come to fruition on how to make hiding them more practical. One such solution is an accordion style panel of wooden strips that are each connected by hinges on both ends. In essence, the platform folds into a drawer, with one piece of wood folding on top of another as if you are stacking them. When the drawer is pulled out, the wooden frame of the bed pulls flat, with the hinges flush making a level surface for the mattress. That’s it. | Source 1, 2. With a front and back measuring 6.75″ X 16.5″ the dimensions will create a desk looking nightstand that has the ideal width for one drawer. The length houses a lamp and clock without looking cluttered or distracting. If you do not have the skills and patience with a set of tools, and would prefer to keep your large living areas organized, the Moebe large shelving format is prudent. Capable of taking up an entire wall, the system utilizes wooden wedges to keep shelves from moving. Rounded steel uprights connect to the shelves in seconds by being placed through the pre-drilled holes. Black stained ash wood and oiled oak offer two diverse palettes to blend in to any setting. The Moebe approach is the most painless experience possible start to finish to consolidate messy rooms fluidly without brackets, glues and other frustrating elements that slow you down. Differing from the Moebe shelving system is the Benjamin Hubert inspired flexible alternative known as ‘Shift.’ The idea behind its foundation is derived from retail outlets, who are in frequent need of swapping out their displays. The genius of the setup is that magnetic panels are mounted to the wall, with shelves having the capability to be moved at the drop of a hat. This process can be done at home, by lining each shelf with a magnet on the bracket that will hold it in place on the panels. With both the base and shelf boards connecting by these magnets, changing the style and appearance of the furniture can be accomplished in seconds.